We all use tools in our everyday lives to make things easier, faster and simpler. With all the tasks an SEO has to do for each client on a regular basis — constantly checking and fine tuning campaigns — tools that get the job done right can come in handy. 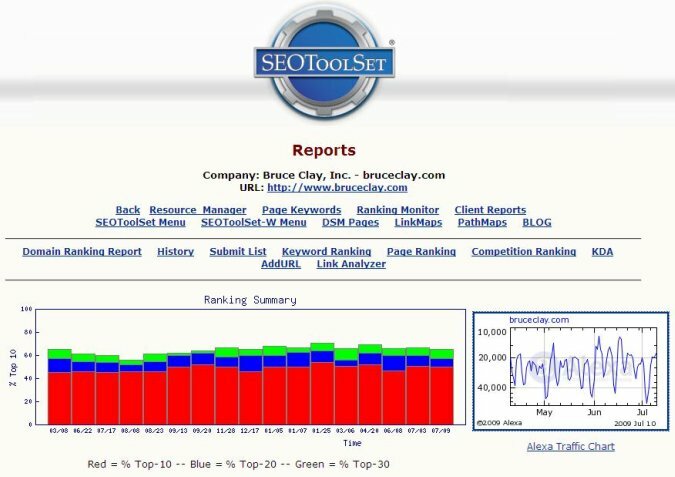 Bruce Clay, Inc.’s SEOToolSet is a suite of more than 15 organic SEO tools, each performing a different role in the search marketer’s tool belt. We’ve been featuring the tools here on the Bruce Clay blog to document how and why a search marketer can use each to their advantage. Next up: the Search Engine Ranking Monitor and its various reports. There are more than 10 reports that can be pulled from the Search Engine Ranking Monitor, so I’ll be covering this tool in two parts. I probably don’t need to go into much detail here. You know why you pay attention to search engine rankings. The higher the position, the more likely it is that visitors will come to the site looking for information on the queried topic. And the higher the ranking, the better the visibility the site receives. When used in conjunction with other metrics and analytics, ranking data can be valuable intelligence for a strategic SEO campaign. It also doesn’t hurt that ranking is a metric SEO clients care about. Bruce Clay predicted the decline of rankings as an SEO metric late last year because as a searcher’s location, preferences and past behavior increasingly influence rankings on a per-user basis, the ranking of results becomes nearly impossible to predict. However, today’s search engines are still relatively uniform in the results they return. Some testing has shown little variation among the top four results and a minor reordering of page-one results in most cases. Bruce explained that personalized search may move beyond such subtle re-ranking in the future, and that rankings will become less meaningful as personalization continues to develop on search engine results pages. But under today’s conditions, rankings are still a metric to pay attention to because they remain an attainable indicator of success. The benefit of ranking data is amplified when used with the intelligence of other Web analytics. And most of all, clients care about rankings. They want to see where their site rankings stand and to be notified of any movement in rankings. Why not give them what they want? Like the name suggests, the Search Engine Ranking Monitor checks for the ranking information of pages within the specified domain, as well as the number of pages indexed by each of the reported search engines and visitor traffic information. 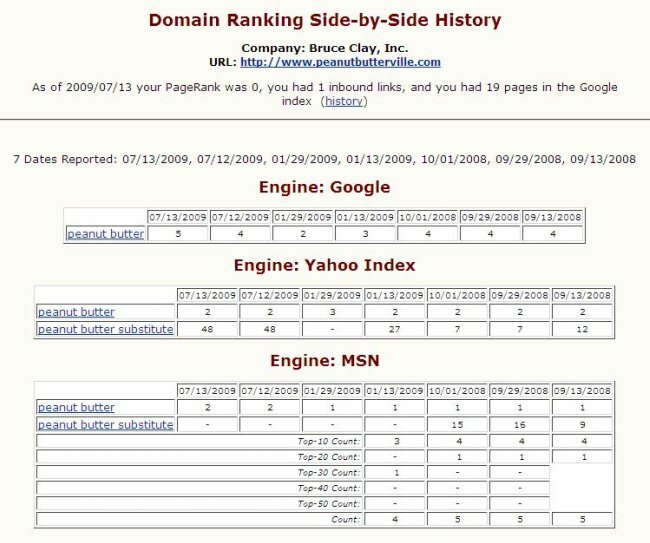 The Search Engine Ranking Monitor checks Google, Yahoo and Bing (listed as MSN) by default, but can also check foreign flavors of the engines, like google.com.au, yahoo.com.uk, etc. Currently, the Search Engine Ranking Monitor supports about 13 countries. The data collected by the monitor can then be filtered and viewed in a number of reports, by page or by keyword, for instance. By compiling and viewing reports through the Search Engine Ranking Monitor at regular intervals, any changes in search engine positioning can be quickly and easily identified. Likewise, if the number of indexed pages rises or falls, this can signal a change to the site’s robots.txt file or on-page Meta tags that may not have been intended. 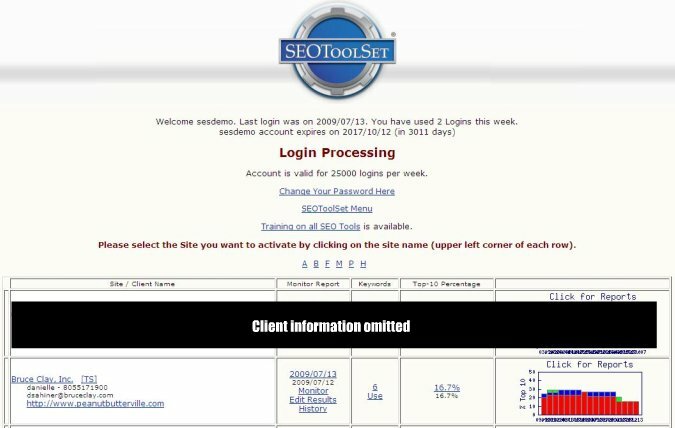 The Search Engine Ranking Monitor automatically runs once every two weeks and SEOToolSet subscribers are emailed links to the associated bi-monthly reports. However, all reports can be run on command as well. After logging into the SEOToolSet, select either “Client Reports” or “Click for Reports” from the far right column of the site you’d like to analyze. “Click for Reports” appears along with a graph if the Search Engine Ranking Monitor has been run for the site at least twice; otherwise a user will see the text “Client Reports”. Further down the page are the forms for manually running the various reports. A notification of these reports is delivered to the SEOToolSet subscriber via email every time a monitor runs, however, a report through the Search Engine Ranking Monitor can be manually run at any time. This report lists the top-50 rankings within Google, Yahoo and Bing (MSN) for keywords targeted on the specified domain. It also reports the search activity of targeted keywords, and the number of results Google reports for the keyword as well as the number of results Google reports for the keyword queried with the allintitle: command. To view the most recent Domain Ranking Report, select “Current Report” next to the button that reads “Domain Ranking Report” and then click the button. In table above you can also see information about the number of pages ranked for keywords within the top 10, 20, 30, 40, and 50 search engine results. 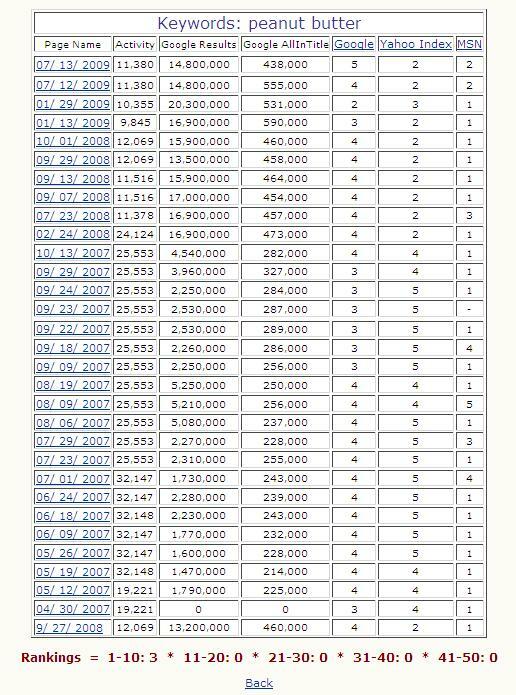 This table is followed by another table which outlines the history of ranked pages for the domain, as seen below. Here you can see that the Search Engine Ranking Monitor has been gathering data for this domain since September 2007. The column labeled “Opport” is the number of keywords being monitored multiplied by the number of search engines being checked — effectively representing the number of opportunities a domain has to rank in the top results for their keywords. The columns titled “Top 10”, “Top 20” and so on illustrate the percentage of opportunities that rank in the top 10, 20, etc., results for the domain’s designated keywords. 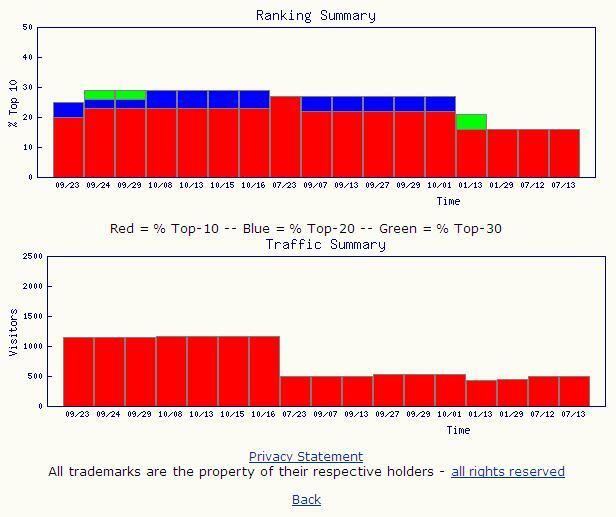 At the end of the Domain Ranking Report are two bar graphs: the Ranking Summary and the Traffic Summary. The Domain Ranking Report Ranking Summary represents the percentage of opportunities in the top-10, top-20 and top-30 results for keywords targeted across the domain. In this graph, red represents only first-page results (the top 10), blue represents second-page results (the top 20), and green represents third-page results (the top 30). The Domain Ranking Report Traffic Summary reports the estimated number of visitors to the site over time based on rankings and the estimated activities for each keyword. Both graphs visualize trends over time for the clear recognition of favorable or unfavorable activity. By viewing ranking trends visually over time the user can clearly recognize any ranking movement, and by visualizing visitor activity over time the user may be able to pinpoint traffic fluctuations and trends in audience behavior. 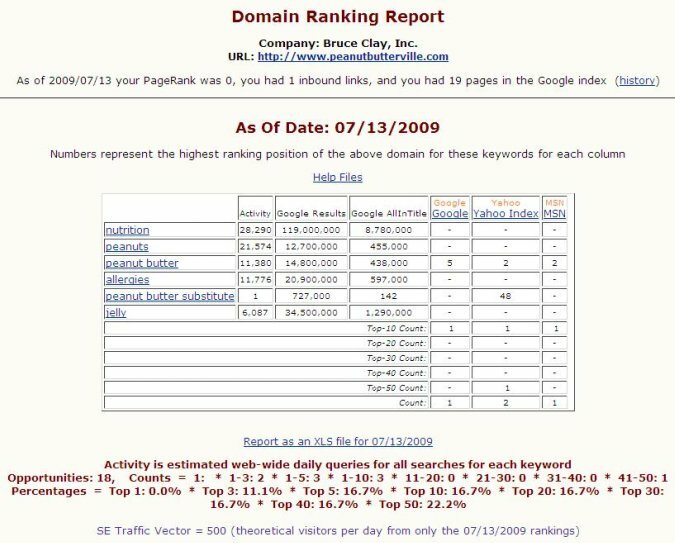 This report compares search engine ranking by keyword for two dates the user chooses. To view the Comparative Domain Ranking Report, select the two dates you’d like to compare and then click “Comparative Domain Ranking Report”. For each keyword, the report gives three numbers for each engine. The top number is the top ranking for the keyword as reported on the first date entered. The middle number is the top ranking for the keyword as reported on the second date entered. The final number is the difference between the first and the second number, showing the user whether the keyword’s top ranking went up or down. The Comparative Domain Ranking Report seen above will deliver information for all the keyword assigned to the domain. In the case above, I have removed information on all but one keyword that’s assigned to the domain because data for the other keywords was insufficient and, thus, distracting. Near the top of the report you can see what two dates are being compared. In this case I’m comparing today’s report with a report run in January. Under each search engine column you can see three numbers. The top number is the ranking of “peanut butter” as reported today. The second number is the ranking of “peanut butter” as reported in January. 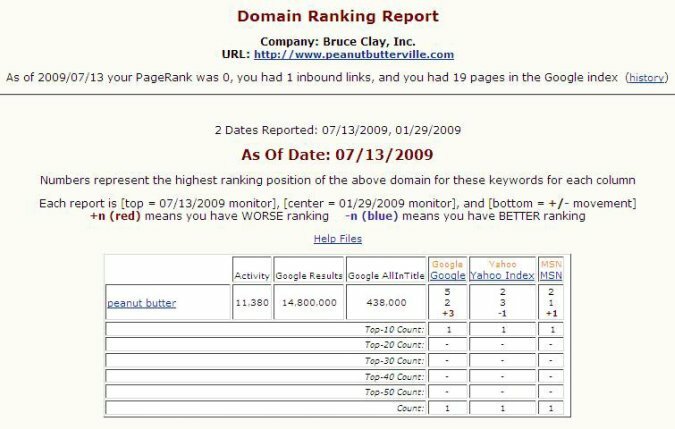 In the seven months that elapsed between the two dates, the domain’s ranking for peanut butter dropped two positions in Google, gained one position in Yahoo and dropped one position in Bing (MSN). 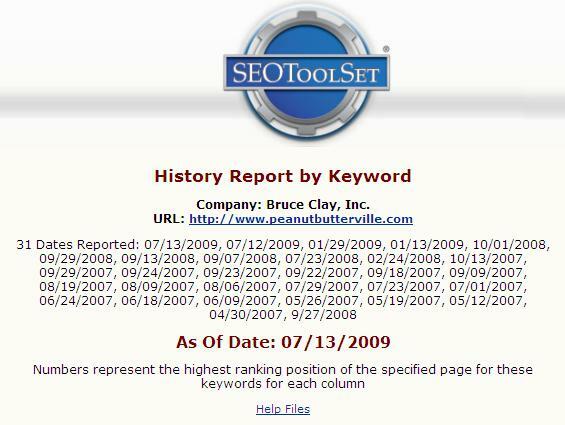 This report compiles the historical ranking data by keyword. To view a History Report by Keyword, select the keyword you’d like to analyze from the drop-down menu and then click the button that says “History Report by Keyword”. The resulting page first lists the date of all the reports that are being reported. In this case, 31 prior reports have been compiled for the keyword “peanut butter”. The table that follows is ordered by date from most to least recent. Information reported includes the activity volume of the keyword, the number of results Google reports for the keyword and for an allintitle: command with the keyword, and the top ranking of a page for the keyword within Google, Yahoo and Bing (MSN). An SEO can keep track of ranking trends over time using this report. This report lets you view up to eight of the most recent rankings reported for each keyword by Google, Yahoo and Bing (MSN). View this report by selecting the text link “Side-by-Side Ranking Comparison”. The resulting page has a table for each search engine. 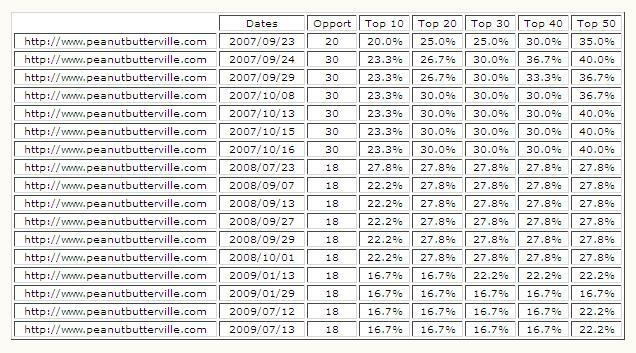 The top ranking position within the domain is reported for each date. Also reported are the number of times a top 10, 20, 30, 40 and 50 ranking was reported for these keywords. Here you can see the ranking for top keywords within each engine over time. The format makes for easy comparison of rankings between the three search engines. Slicing and dicing search engine ranking data in different ways can bring different insights. In part two I’ll outline the rest of the reports that are bundled in with the Search Engine Ranking Monitor. That means the Linked and Indexed Pages Report, the Changed Page Monitor Report, the Ranking Report by Keyword, the Detailed History Ranking Report, the Ranking Report by Page Name, the Competitor Ranking Report and the Specific Competitor Ranking Report are coming your way later this week! The Fastest Search Engine Ranking Monitor. Ever. 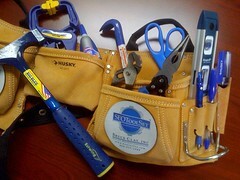 The toolset is SaaS. You can subscribe from our SEO tools page. The toolset will absolutely work internationally. This looks interesting, where do I get SeoToolSet? Is it SaaS or do you download the software in your computer? Does it work on other counties? With all this technology in place to help us now, its amazing to think how far we’ve come from the business tools of yesterday.